When it comes to memory verses, this one has always been a favorite, so I was more than excited for my girls to learn it. I remember being a little girl, around 5 years old, and going to my grandmother’s church. They had missionettes and I got to be in the Daisies class with Sis. Barbie. She taught me this verse and I have never forgotten it. In fact, I can never read or hear this verse without seeing myself sitting across from her at the moon-shaped table in that little Sunday school room. If I think back as far as I can remember, this particular verse is the first one I ever memorized! That’s why it is a favorite of mine and I’m thrilled to share it with my children. 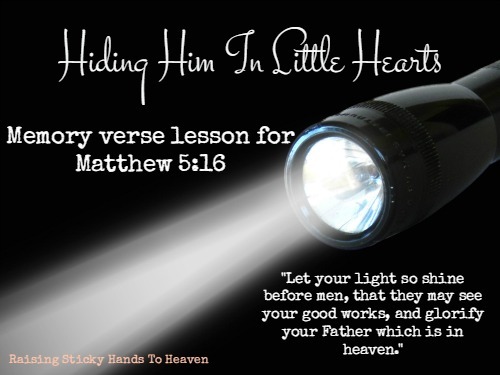 When we discussed this verse, I used a really simple demonstration to show my girls what being the light means. For this demonstration, all you need are 2 things: a flashlight to represent yourself, and the battery to represent Jesus (make sure the battery isn’t in the flashlight until you are ready). 1. Everyone knows a flashlight has one purpose. The purpose it was created for is to shine light in the darkness. 3. It looks like our flashlight isn’t working! Maybe if we put this battery in it will help. (Put the battery in the flashlight and turn it on. This time it will work.) It seems our flashlight will only work if the battery is inside. Without the battery, it cannot fulfill it’s purpose. Did you know, just like that flashlight, our purpose is to shine a light in the darkness? That’s what this verse is all about. God created us to shine His light to all men so that He can be glorified. And just like that flashlight, we will never do what we were created to do unless we have a battery. For us, that battery is Jesus, who lives in our hearts if we have accepted Him as our Savior. If Jesus doesn’t live in our hearts, our light will not shine. Even thought the flashlight looked like it was ready to work, it just couldn’t until the battery was inside. We can’t just look the part. We actually have to have Jesus in our hearts in order to represent Him and shine His light. When we have our “battery” in place, we can light up the darkness all around us, just like we were created to! The following song is a great tool to help your little ones with memorization. Naomi and Adah love this song and can’t help but dance and worship to it! Now what about you and your little ones? Are your batteries in place? Fulfill your purpose and overtake the darkness with the bright light of God!